I don't often buy hair styling products. I've never really believed that they can live up to anywhere near their claims. I remember when I first bought a John Freida Frizz-Ease serum back in the 90's - the advertising campaign had left me with expectations far beyond anything the product could deliver. Disappointment hit hard and subsequent purchases of thickening, straightening and volumising serums, sprays and pomades have only contributed to this feeling of betrayal. 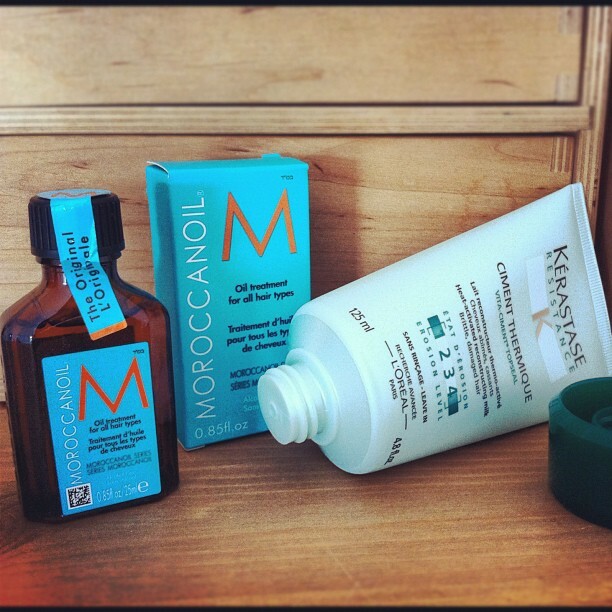 Morroccanoil is a hair treatment and styling product in one. I ignored the initial hysteria this product created when it first came out, but I am now on board with all its argan oil goodness. It'll repair your hair, adding protein and protecting it from heat styling. It also makes your hair dry quicker, so if you use a hair dryer, it helps you prevent further damage. It leaves your hair shinier and more sleek, without leaving it feeling greasy or weighing it down, which is essential if you've got fine hair like me. And seeing as it's quite expensive, the good news is that a little goes a long way. 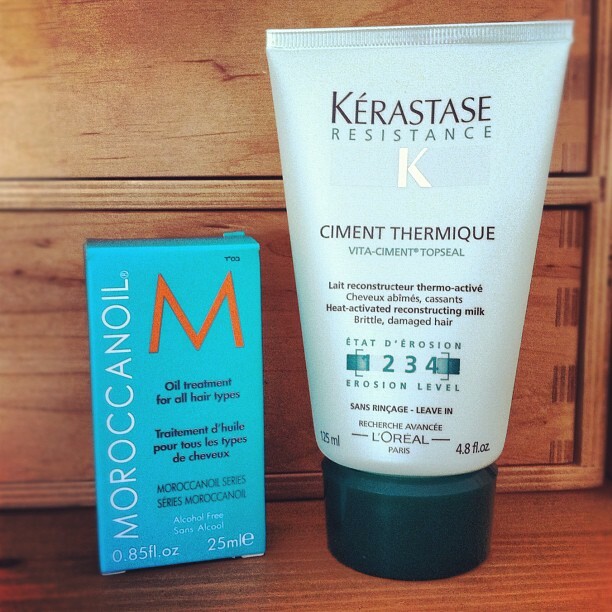 Ciment Thermique is part of the Resistance rang by Kerastase, designed for weakened hair. My hair (yes, have I mentioned it's fine? Fine, fine, fine) is prone to breakage, and so my hairdresser recommend I try this. It strengthens the internal hair fibre, plus forms a protective layer for the external hair shaft, making it stronger. The product is heat-activated, and has a milky texture - smooth it onto wet hair before blow-drying. My hairdresser recommended I use it roughly every five washes, so at that rate, this tube should last me months. I've been using these for a few weeks now and can report that split ends and hair breakage do seem to be on a go slow. The recent torrential downpours would normally be enemy number one for my fine frizz, but with these products in my arsenal, I'm fighting the good fight.